Maine is located in the New England region of the northeastern United States, bordered by the Atlantic Ocean to the east and south, and by New Hampshire on the west. Summers are generally moderate and humid, while winters are cold and snowy. Maine is known for its scenic, rocky coastline, rolling mountains, densely forested interior and beautiful waterways. The state of Maine is also known for its seafood cuisine, especially lobsters and clams. Some of the state's most popular attractions include Acadia National Park, coastal fishing villages and lighthouses, Baxter State Park, whale watching trips and much more. To travel around the state, you will need to book a bus or train ticket. For more information, visit: visitmaine.com. The Abbe Museum teaches visitors about the culture and history of the Wabanaki, Maine’s Native American people, at two locations in Bar Harbor. The downtown location has exhibitions, activities and special programs and is open year-round, while the Sieur de Monts Spring location is open from May to October and focuses on archaeology and the early days of the Abbe Museum. Fort Knox in Prospect is Maine’s largest historic fort. The fort was built as a defense against the British in 1844 and is now open to the public from May to October. During these months, visitors can also take guided tours of the fort and enjoy the Penobscot Narrows Bridge observation tower for views of the Penobscot River Valley. Learn about the maritime history and culture of Maine at the Maine Maritime Museum in Bath. Exhibits, a 20-acre historic shipyard, artwork and other artifacts from its collection of 20,000 objects are regularly on display at the museum and special educational events are held throughout the year. The Maine State Museum in Augusta tells the story of the last 12,000 years of Maine’s history through its archaeological collections, historic artifacts, natural science and cultural exhibits, and special events. 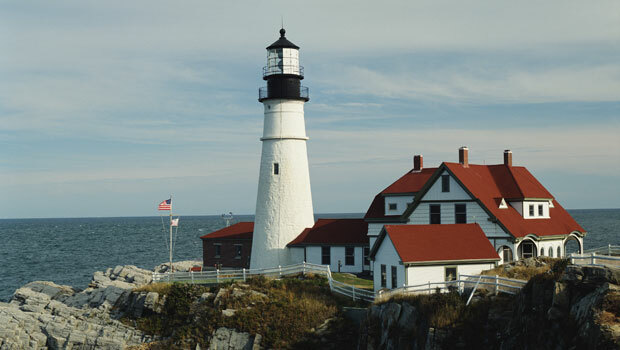 Lighthouses are an iconic part of Maine’s 3,500 miles of coastline and a popular attraction for many visitors. Portland Head Light sits at the entrance to Portland Harbor and was built in 1791, making it the oldest lighthouse in Maine. Located within Fort Williams Park, visitors can also see The Museum at Portland Head Light in the former Keeper’s Quarters. The United States offers a wide variety of cultural learning opportunities through the arts. Dance, music, theater, opera, art museums and festivals are just some of the options available to international visitors who wish to experience the U.S. and its culture. The Maine Black Bears is the name of the University of Maine’s athletic programs. Visitors can watch college teams play sports like football, basketball and baseball as a cheaper alternative to professional sports games. International participants interested in motorsports should check out the Mainely Motorsports website for track and tour information. Portland Head Light Station, Cape Elizabeth, Maine. Acadia National Park is home to Cadillac Mountain, the tallest mountain along the east coast of the United States. Hiking, biking, swimming, boating and camping are only some of the outdoor activities available at the park during the year. Go for a (cold) dip in the ocean at one of Maine’s beautiful beaches. The water is chilly but it doesn’t stop residents and visitors from swimming, surfing, sunbathing and boating. Coastal Maine Botanical Gardens is located in Boothbay along the coast of Maine and is almost 250 acres in size. There are many types of themed gardens and landscapes at the Gardens along with trails, waterfalls, sculptures, art exhibits and other special events open to the public. Hike sections of the Appalachian Trail, a backpacking trail that runs for approximately 2,200 miles (3,500 km) from Maine to Georgia. The Appalachian Trail is more suited for experienced hikers, so beginners may want to try an easier trail using the Maine Trail Finder website. Baxter State Park and Mount Katahdin, the tallest peak in Maine, offer many opportunities to get outdoors, including hiking, rock-climbing, camping, swimming, snowmobiling and fishing. Mount Katahdin also marks the end of the Appalachian Trail. White Mountain National Forest has many outdoor activities like hiking, mountain biking, camping, swimming, fishing, canoeing, kayaking, skiing, snowboarding, snowshoeing and sledding. Skiing and snowboarding areas are popular winter destinations in Maine. Both downhill and cross-country skiing are available in the state and beginners can take lessons before heading down the slopes, if needed. Some visitors may prefer other winter activities like snowmobiling, dog sledding, snow tubing, sledding and ice skating. Maine is best known for its seafood, especially lobsters. Lobster rolls are a favorite local food in Maine along with other New England specialties like clams, oysters, mussels, salmon, scallops and other fresh seafood. Many ethnic groups have made Maine their home and visitors will find communities with a strong connection to their heritage as they travel through the state. Ethnic restaurants, festivals and celebrations featuring traditional foods are not uncommon in Maine. Examples of cultural groups in Maine include Native Americans, Acadian, Franco-American, African-American, Finnish, Swedish, Greek, Italian, Thai, Vietnam and many, many more. Find farmers’ markets and other places to buy fresh, local produce in Maine at the Get Real, Get Maine website from the Maine Department of Agriculture, Conservation and Forestry. For a unique and local perspective on American cultural, be sure to check out festivals and events near your cultural exchange program location. These events are a fun and interesting way to interact with locals and to learn more about American culture by experiencing it firsthand. The Mushers Bowl Winter Carnival is a January event that celebrates all things winter in the Greater Bridgton Lakes region with dog sled rides, snowmobiling, ice skating, snowshoeing, ice fishing and other fun activities. Portland on Ice in January/February highlights Portland’s art and cultural attractions and venues, including its diverse music scene, museums, galleries and shops. The month-long celebration Longfellow Days honors the American poet Henry Wadsworth Longfellow, who lived in Brunswick and worked at Bowdoin College. Cultural events are held throughout February, such as lectures, film screenings, tours of the Longfellow house and museum and readings. Many of the events are free of charge. Patriots Day Celebration in Ogunquit commemorates the first battles of the American Revolutionary War with colonial re-enactments, an arts and craft show, live music, food tastings, children’s events and more each April. In June, the Portland Performing Arts Festival presents music, dance, theater and performance arts over five days in Portland’s Art District, including some free events like dance lessons, outdoor art and lectures. Maine Lobster Festival is a five-day event with live entertainment, a parade, arts and crafts, US Navy ship tours, a 10K road race, food vendors, and over 20,000 pounds of lobsters. The event is held in late July/early August in Rockland. Public transportation options can be hit or miss, depending on your location in the United States. Buses are a common transportation option for short and long-term travel in the U.S., while some areas will also have trains, subways and other options. The Greater Portland METRO Bus serves the Portland region with 8 bus routes. A separate bus system operates in South Portland with 3 bus routes. For transportation from Portland to Casco Bay islands, visitors can use the ferries from Casco Bay Lines. For public transportation systems in other parts of Maine, visit the American Public Transportation Association website. Amtrak trains offer limited service to southern Maine and other locations in New Hampshire and Vermont. There are many ferry services in Maine, including ferries that travel to some of the 4,600 islands located off the Maine coast. For more information on biking in Maine, visit the Explore Maine website for bike trails, safety tips, bike tours and other helpful information. Volunteermatch.org, Idealist.org and Serve.gov are three general volunteer websites that match local organizations with volunteers in their communities. The Good Shepherd Food Bank helps feel the hungry in Maine and needs volunteers to help sort donations and with other tasks. Volunteers may help out for a short period of time or on an on-going basis. Volunteer Maine allows volunteers from all parts of the state to search for a local opportunity that matches their location, interests, skills and availability. Habitat for Humanity has local affiliated across Maine to help build affordable housing for families in need. Volunteers build each home and anyone over 16 years old can help out in some way – no experience required. Learn more by visiting the relevant website for your area – Portland region, Bangor region, the Midcoast region or one of the seven other Maine affiliates.